Iron Galaxy and Modus Games bring you Extinction – an action-adventure game centered around a lone warrior named Avil who is tasked with battling towering ogres in a last-ditch attempt to save humanity. Get the lowdown on game features, system requirements, available editions, and more on our Extinction Hub! In Extinction, you play as intrepid hero, Avil, the last of an ancient order and the only human skilled enough to go against the giant Ravenii invading the kingdom of Dolorum. Defend your homeland from the colossal giants and their minions in epic, real-time, skill-based combat. Find out what else we know about the game right here! The world of Dolorum is steeped in lore, and its inhabitants take their inspiration from reference points as far-reaching as Iron Galaxy’s Killer Instinct games, Shadow of the Colossus, Attack on Titan, and action-RPGs. The world of Extinction is a brutal world of conflict, a land besieged by giant ogres known as the Ravenni. Find out exactly what we know so far about the setting of the upcoming release! Extinction is about 1v1 encounters against vastly bigger and more powerful enemies. Explore all the moves and special abilities Avil has at his disposal to prevail against the giant beasts. Explore the variations between the ogres, known as the Ravenii, and the other enemy types in Extinction that'll keep you on your toes. Humans versus 150-foot ogres. That’s the crux of Extinction’s gameplay across all of its modes, but the exact nature of your objectives does differ from mode to mode. We talked to Modus Games about their upcoming release Extinction to get the lowdown on the inspiration behind the game and what we should be excited about! 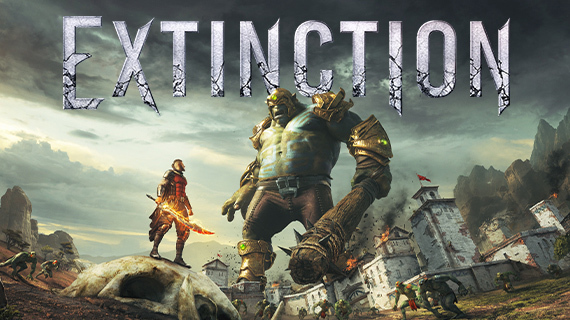 Your Chance to win a copy of Extinction. Enter our giveaway for a chance to win a key for the game and step into the shoes of Avil, the last Sentinel, as you battle to save your world from these colossal nightmares.